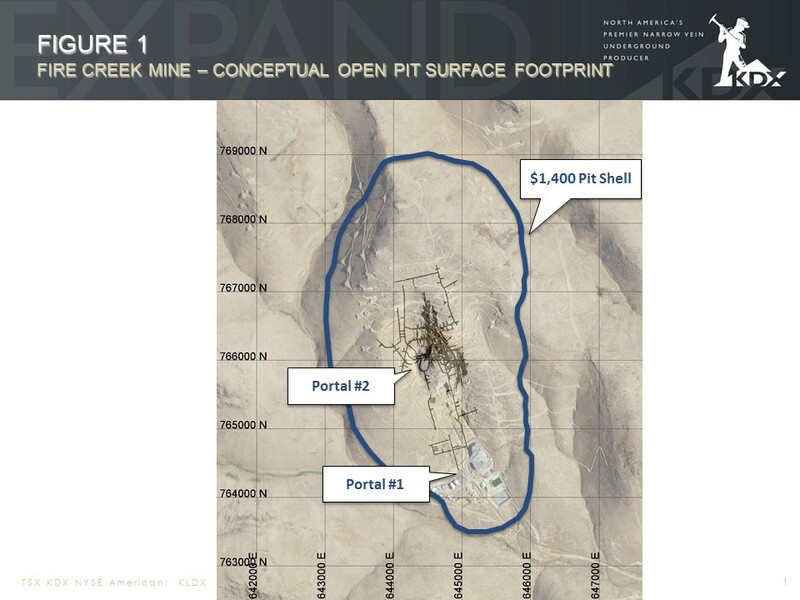 VANCOUVER, BC--(Marketwired - December 21, 2017) - Klondex Mines Ltd. (TSX: KDX)(NYSE American: KLDX) ("Klondex" or the "Company") is pleased to provide an initial open pit Mineral Resource estimate for its Fire Creek mine ("Fire Creek") located in northern Nevada, USA, which incorporates the results from the 2017 open pit surface and underground exploration drill programs. This Mineral Resource estimate is in addition to the Company's previously announced underground Mineral Resources. Klondex plans to provide a complete Mineral Reserve and Resource update, for all sites, during the first quarter of 2018. 1. Mineral resources are calculated at a gold price of US$1,400 per ounce and a silver price of US$19.83 per ounce. 2. Metallurgical recoveries for gold and silver are 65% and 30%, respectively for oxide mineralization and 60% and 25% respectively for mixed mineralization. 3. One ounce of gold is equivalent to 183.53 ounces of silver. 4. Mineral Resources include 10% dilution and 5% mining losses. 5. Cut off grades for the Mineral Resources are 0.01opt AuEq. 6. The effective date for the Mineral Resource is November 30, 2017. 7. Mineral Resources which are not Mineral Reserves have not yet demonstrated economic viability. The estimate of mineral resources may be materially affected by environmental, permitting, legal, title, taxation, sociopolitical, marketing, or other relevant issues. 8. The quantity and grade of reported Inferred Resources in this estimation are uncertain in nature and there has been insufficient exploration to define these Inferred Resources as an Indicated or Measured Mineral Resource and it is uncertain if further exploration will result in upgrading them to an Indicated or Measured Mineral Resource category. 9. The Mineral Resources in this press release were estimated using the Canadian Institute of Mining, Metallurgy and Petroleum (CIM), CIM Standards on Mineral Resources and Reserves, Definitions and Guidelines prepared by the CIM Standing Committee on Reserve Definitions and adopted by CIM Council. Mr. Paul Huet, President and CEO, commented, "The results of this initial open pit drill program are extremely exciting for Klondex. We believe that the addition of these open pit mineral resources has the potential to significantly extend Fire Creek's mine life." Mr. Huet continued, "Fire Creek continues to demonstrate it is a world-class property and we now have data suggesting the underground and open pit potential is robust with the possibility for these resources to significantly expand with our continued district exploration programs. We will continue to maximize the full value of this asset for our shareholders. 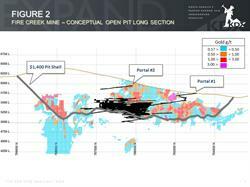 Management will continue to focus our efforts on the higher grade, underground mineralization while exploring and evaluating strategic alternatives to advance and develop the open pit potential of this asset." In 2017, a total of 21 surface and 10 underground core drill holes were drilled for a total of 14,758 ft (4,498 m). This drilling targeted wide zones of low grade mineralization above the high grade vein system currently in production, with the intent to develop a bulk minable resource. Also included in these new resources is historical drilling conducted since 2004, which consists of 1,474 surface and underground drill holes totaling 1,022,240 ft (311,578 m). A technical report in support of the Mineral Resource estimate described herein and prepared in accordance with National Instrument 43-101 will be filed on SEDAR and EDGAR within 45 days from the date hereof. Scientific and technical information in this press release has been reviewed and approved by Mark Odell, P.Eng. (NV Lic#13708) of Practical Mining LLC, an "independent qualified person" within the meaning of National Instrument 43-101. 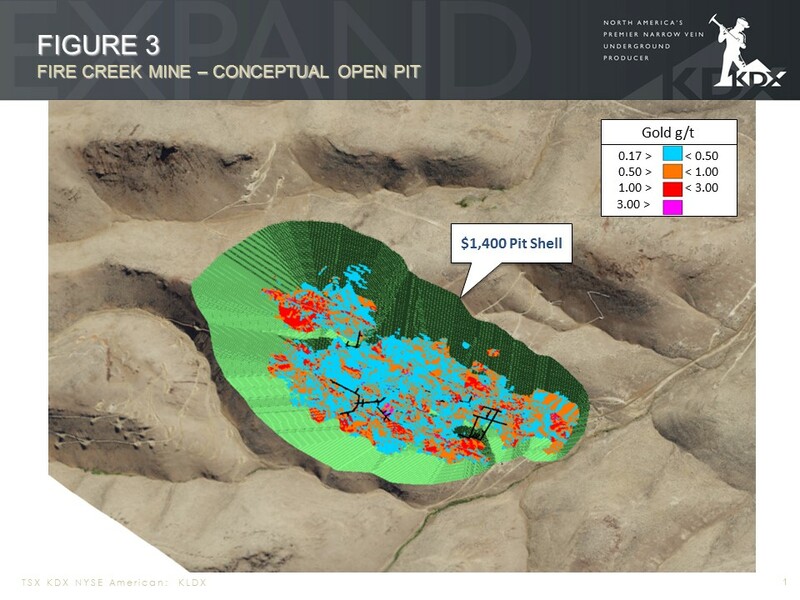 Klondex is a junior-tier gold and silver mining company focused on exploration, development, and production in a safe, environmentally responsible, and cost-effective manner. The Company has 100% interests in four producing mineral properties: the Fire Creek Mine, the Midas Mine and ore milling facility, the Hollister Mine, all of which are located in the state of Nevada, USA, and the True North Mine and mill in Manitoba, Canada. The Company also has a 100% interest in the Aurora mine and ore milling facility, also located in Nevada, USA. This news release contains certain information that may constitute forward-looking information or forward-looking statements under applicable Canadian and United States securities legislation (collectively, "forward-looking information"), including but not limited to the Company remaining focused on mining and further delineating high grade underground veins while looking for strategic alternatives to advance the open pit resource, the new information significantly extending Fire Creek's mine life, the exploration potential at the Fire Creek Mine, the timing of an updated mineral reserve and mineral resource update and future exploration and production plans of Klondex. This forward-looking information entails various risks and uncertainties that are based on current expectations, and actual results may differ materially from those contained in such information. These uncertainties and risks include, but are not limited to, the strength of the global economy; the price of gold; operational, funding and liquidity risks; the degree to which mineral resource estimates are reflective of actual mineral resources; the degree to which mineral reserve estimates are reflective of actual mineral reserves; the degree to which factors which would make a mineral deposit commercially viable are present; the risks and hazards associated with underground operations; and the ability of Klondex to fund its substantial capital requirements and operations. Risks and uncertainties about the Company's business are more fully discussed in the Company's disclosure materials filed with the securities regulatory authorities in Canada and United States available at www.sedar.com and www.sec.gov, respectively. Readers are urged to read these materials. Klondex assumes no obligation to update any forward-looking information or to update the reasons why actual results could differ from such information unless required by law. The terms "mineral reserve", "proven mineral reserve" and "probable mineral reserve" are Canadian mining terms as defined in accordance with Canadian National Instrument 43-101-Standards of Disclosure for Mineral Projects ("NI 43-101") and the Canadian Institute of Mining, Metallurgy and Petroleum (CIM)-CIM Definition Standards on Mineral Resources and Mineral Reserves, adopted by the CIM Council, as amended ("CIM Definition Standards") These definitions differ from the definitions in the SEC Industry Guide 7 ("SEC Industry Guide 7") under the Securities Act. The terms "mineral resource", "measured mineral resource", "indicated mineral resource" and "inferred mineral resource" are defined in, and required to be disclosed by NI 43-101; however, these terms are not defined terms under SEC Industry Guide 7 and are normally not permitted to be used in reports and registration statements filed with the SEC. Investors are cautioned not to assume that all or any part of a mineral deposit in these categories will ever be converted into reserves. "Inferred mineral resources" have a great amount of uncertainty as to their existence, and great uncertainty as to their economic and legal feasibility. It cannot be assumed that all, or any part, of an inferred mineral resource will ever be upgraded to a higher category. Under Canadian rules, estimates of inferred mineral resources may not form the basis of feasibility or pre-feasibility studies, except in rare cases. Investors are cautioned not to assume that all or any part of an inferred mineral resource exists or is economically or legally mineable.